These trips can expose you to the weather elements for a longer period of time. They are more strenuous and require more physical ability. Level 2 trips may last up to 3 hours in length. 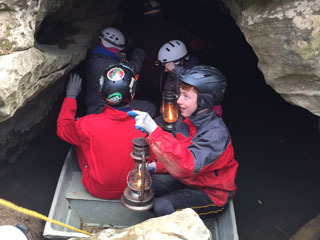 Level 2 caving trips visit undeveloped cave passages and offer longer periods of crawling through small, constricted passages. Extended periods of bending, stooping and on occasion belly crawling might be required. Wet conditions, which may or may not exist, can create the possibility of hypothermia. Cascade Cave has been developed for commercial tours, but the fun begins when you head into the darkness and leave the tourist route behind. Participant will get a chance to walk the commercial routes and enjoy the formations along with scrambling over breakdown, attempting some duck walking, and experiencing some hand and knee crawls. Cascade is one of the largest caves found at park, and in my opinion, this tour is one of the best ways to appreciate its size. This tour, unlike the commercial tour, will cause some of those assorted aches and pains associated with caving. Meets at lodge. Transportation required. While the bats are sleeping in the front of the cave, we will be entering into the back of the cave after a quarter mile hike to the cave entrance. Bat Cave is a completely wild cave with the exception of the cave gates. This trip is a combination of walking, duck walking, scrambling over breakdown piles, creek crossings, belly slides, and hand and knee crawls. You get the whole package with the cave being a combination of dry, muddy and wet. How wet you get depends on how merciful your guide is. Trip Fee: $8.00 - Meets at lodge. Transportation required. Like climbing trees? Recreational tree climbing is a popular high adventure activity that puts a twist to our backyard tree climbing pastime. We will cover what the traditional tree climbing schools are teaching, which is traditional double rope technique that involves using a modified hip thrust to pull themselves 20-40 feet off of the ground. The location will not only give you a great view, the classroom portion will be sheltered from the elements. Participants 15 years and under require parent or guardian supervision. Required equipment includes climbing appropriate gloves and warm clothing. Trip Fee: $8.00 - Follow signs from in front of lodge to site. No transportation required. This trip is intended for new cavers and other interested persons. 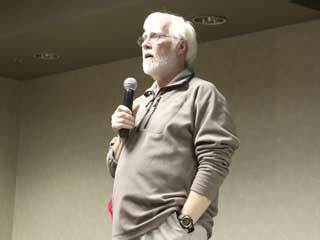 After a brief slide presentation and short discussion, we will take an easy trip into the back of Bat Cave. The group will travel approximately eight hundred feet into the cave, doing some walking over breakdown, some stoop-walking, and a short optional hands-and-knees crawl. The trip will include information on geology, bats, and caving techniques as well as a comparison and demonstration of basic caving equipment. There will be numerous opportunities for questions. Meets briefly in the Fields Facility of the Lodge before going to the cave; a short drive to the cave is involved. Transportation needed to Bat Cave. A helmet with a chin strap and headlamp will be provided for participants which satisfies the requirement for a helmet with a chin strap and headlamp. Trip Fee: $5.00 - Meets in Fields Facility of lodge. Transportation required. Sandy Cave has a huge and long trunk passage that is part of the Cascade Cave system. It also provides some interesting areas that are accessed by crawling and climbing. The entrance is through a karst window with a 70-foot pool of deep water at its bottom. The guides intend to lower a john boat to the pool and offer a boat ride to dry land. This is subject to cancellation if potential flooding conditions occur. Participants must help carry the boat through the woods for 1/2 mile to the cave on the Friday afternoon trip and from the cave on the 10:00 Sunday morning trip. This cave is only accessible during Winter Adventure Weekend! Tucked back in the woods of Carter Caves State Park is a cave that is noted for its large passages. Instead of electric light we will explore this cave, like the explorers of yore, in the soft ambiance of lantern light. Although you should bring your electric lights for safety purposes we request that they remain off during this trip. Past experience has shown us that adults appreciate this particular trip more than children. This is subject to cancellation if potential flooding conditions occur. This cave is only accessible during Winter Adventure Weekend! Trip Fee: $5.00 - Meets at lodge. No transportation required. The group will hike from the Welcome Center to the back entrance of Horn Hollow Cave, visiting other cave entrances and karst features during the trip. Caving techniques, equipment, how the caves formed, and associated geologic features will be discussed during the trip. A low 100-foot belly crawl in Horn Hollow Cave is optional. There will be a total of 1.5 miles hiking above ground; be prepared to dress appropriately for the weather and your feet may get wet in the cave. A helmet with a chin strap and headlamp will be provided for participants which satisfies the requirement for a helmet with a chin strap and headlamp. The forest is full of wild food - even in the winter! As we hike, we will explore different ecosystems in the park and learn what delicious morsels may be hiding in each. We will also talk tips and tricks and best techniques to increase your chances. If we are lucky and fate smiles upon us, we will even get to taste a few things along the way! This trip requires about 1.5 miles hiking over hilly terrain. Dress for the elements and wear boots with good traction. Come learn all about the amazing diversity of organisms that inhabit the Carter Caves forest. We will discuss everything from why some trees make good whiskey barrels and others do not to how to use different plants when the zombies come. This hike will be about 1.5 miles in length along the Horn Hollow Trail. Trip Fee: $5.00 - Meets at Welcome Center. No transportation required. Discover how caves are mapped. We will learn the basics of cave survey, and what function each survey team member performs. Then we will go into a cave and learn and practice how to read the instruments, as well as how to survey a cave passage by passage. Depending on the turn out, we may split the group by skill level so everyone is learning something new. Participants must have the required equipment for level 2 wild cave trips, visit the cave trip page of the website for details. Class is for ages 14 and up accompanied by an adult. Trip Fee: $5.00 - Follow Signs in front of lodge to Hilltop Room. Transportation required. Eastern KY has a rich and proud coal mining heritage. This trip will strive to show the participants what it was actually like to work in the mines with only the light of various flame lamps. From early clamshell lamps to carbide, the last flame lamp, this will be a history and hands on experience of how the miners did their hard work underground with barely enough light to see. We will have working original examples and explain the history of each type of mine light. You will see original photographs from the day of not only the miners, but also the kids as young as 6 years old that worked in the mines day in and day out. Trip will take place on the commercial routes of Cascade Cave. No Flashlights will be used, participants will be provided a carbide miners light (one light per two people) to light the path ahead. Calling all lady cavers! Join us underground for some much needed girl time. Be prepared for a 1/4 mile hike to the cave entrance. The cave will include some walking, stooping, rock scrambling and of course some crawl passages. These caves contain active streams. Be prepared to have wet feet, wet hands, and possibly more, especially if you slip! No Boys Allowed! Sandy Cave has a huge and long trunk passage that is part of the Cascade Cave system. It also provides some interesting areas that are accessed by crawling and climbing. The entrance is through a karst window with a 70-foot pool of deep water at its bottom. The guides intend to lower a john boat to the pool and offer a boat ride to dry land. This is subject to cancellation if potential flooding conditions occur. Participants must help carry the boat through the woods for 1/2 mile to the cave the Friday afternoon trip and from the cave on the 10:00 Sunday morning trip. This cave is only accessible during Winter Adventure Weekend! Like climbing trees? Recreational tree climbing is a popular high adventure activity that puts a twist to our backyard tree climbing pastime. We will cover what the traditional tree climbing schools are teaching, which is traditional double rope technique that involves using a modified hip thrust to pull themselves 20-40 feet off of the ground. The 2015 location will not only give you a great view, the classroom portion will be sheltered from the elements. Participants 15 years and under require parent or guardian supervision. 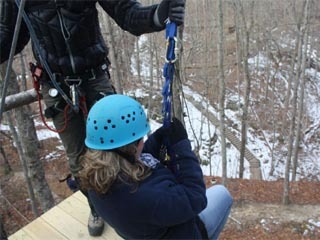 Required equipment includes climbing appropriate gloves and warm clothing. Got what it takes to be a junior cave guide? Find out on this trip. Like "Cascade Kid Capers," tween and teen cavers on will explore the park's most highly-decorated cave, but with an added focus on science! We'll learn basic speleology, how caves form, identification of bats and cave formations, as well as safe caving techniques, park history, and ways to tell stories so we can communicate all that information to tour groups! When done, you'll be a "Karst Kommando," and well on you're way to being a future WAW cave guide! For ages 6-12. Participants must have proper cave gear, including a cave pack, and MUST be accompanied by an adult. Trip Fee: $8.00 - Meets at lodge . No transportation required.